GE Healthcare&apos;s innovative pocket-sized ultrasound features the first of its kind dual probe that houses two transducers in one probe. The Vscan with Dual Probe transforms physical exams that help enable efficient triage, fast workflow, and deepens patient connection. This intuitive device provides a non-invasive look inside the body, with both shallow and deep views, that helps speed diagnostic decisions for a wide range of clinical applications. Vscan with Dual Probe may help fill in the diagnostic gaps when you don't have the full story. The innovative probe with phased and linear array transducers is always connected and ready for many applications. Vscan with Dual Probe can travel with you-from patient to patient-within your primary, critical, or specialty care clinical environment. Count on Vscan with Dual Probe throughout your busy day-a single charge provides up to one hour of continuous scanning. Easy-to-swap batteries can extend operation all day long. Studies used Vscan probe which is equivalent to Vscan with Dual Probe's deep scanning transducer. The picture is clear. 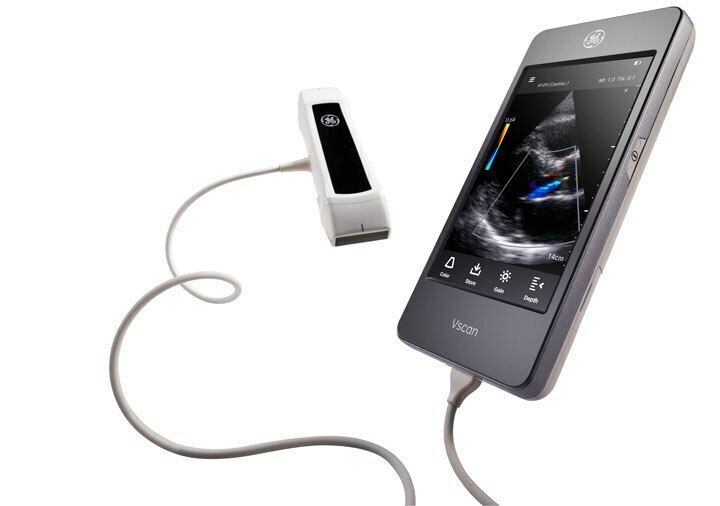 Pocket-sized ultrasound devices offer clinical and economic value. Below you will find information to help you learn the basic functionality, knobology and general maintenance so you can immediately begin using your device. Before you begin the process of activating a Vscan device or gateway software, please locate the "Vscan Getting Started" guide. This double-sided quick reference guide can be found in a white envelope in the box that contained your Vscan product. After locating the "Vscan Getting Started" guide, please follow the initial steps for activation.